Tom and I rarely go to weddings (when we are not working that is) but recently we have two as Bob and Laura got married a few weeks ago (and our nephew is getting married in a couple of weeks). It is very strange to sit back and just enjoy ourselves. 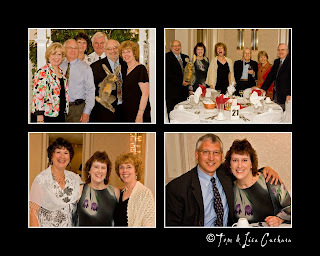 Like Tom and I, Bob and Laura met via our photography (they met at NECCC last summer) and there were two tables from NHCC and a table from CT-PPA. Before the toast the best man described a conversation that he had with Bob about his photography a while back: he was trying to ascertain if Bob might be interested in selling his photographs, etc. -- making money from his hobby since he had bought all this photography equipment. Bob's reply was that he would be very happy if he ever made back his investment on his photography equipment. 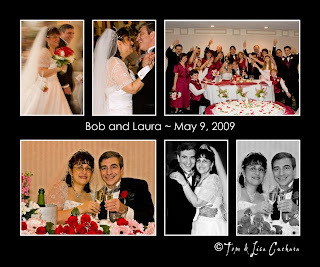 Bob's Best Man at the wedding added to this story that Bob had indeed made back more than ten-fold on his investment because that very investment resulted in him meeting and marrying Laura! Tom had a little fun that evening, trying some interesting flash patterns, panning while the couples walked in, dragging the shutter, etc. 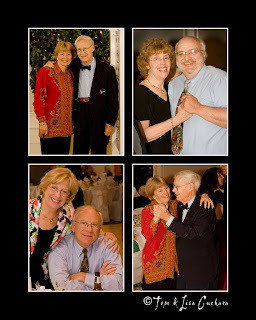 Here are four composites of photos that Tom took -- the whole day both Bob and Laura were just BEAMING. Two very happy people! I am never in the photographs because I am always behind the lens, but I made it into a few that night. Even Art's bunny made it into the photographs!